Following the exhibition Fields (Riga, 2014), we were asked by Armin Medosh to contribute to a series on Kunstradio Vienna, produced by Elisabeth Zimmerman. The exhibition Fields showed works by artists, agriculturalists, designers, technologists and scientists that are truly transdisciplinary and blur the boundaries between different disciplines or fields in a very profound way, and on top are of a socially transformative character. These works now find continuation through on- and offline projects. This broadcast series entitled ‘Kunst Fields’ presents work by 6 artists who participated in the show and a 7th work by curator Armin Medosch. This work called Wild Ontologies looks at creatively making taxonomies as a performative practice. Welche transdisziplinären Kreuzungen verschiedener Felder haben das größte Potenzial zu nachhaltigen und wünschenswerten gesellschaftlichen Veränderungen zu führen? Dieser Frage ging die Ausstellung „Fields“ nach, die im Sommer 2014 im Arsenal in Riga stattgefunden hat. Kuratiert wurde die Ausstellung von Rasa Smite Raitis Smits und Armin Medosch, mit rund vierzig Arbeiten von Künstlerinnen und Künstlern aus aller Welt, aber mit Schwerpunkt Mittel- und Osteuropa. Für das Kunstradio hat Armin Medosch nun erneut einen Querschnitt durch die Ausstellung „Fields“ gezogen und als Gastkurator die Produktion von sechs Arbeiten initiiert, die einen Bezug zur Radiokunst aufweisen. Bei einem Teil dieser Arbeiten steht ein neuer Bezug zur Natur im Vordergrund. Im Kunstradio werden diese Beiträge in zwei Sendungen präsentiert, am 23. November und am 30. November 2014. Kunstradio – Radiokunst is a weekly radio art program on the cultural channel Österreich 1 of the ORF (Austrian National Public Broadcaster). Kunstradio was founded by Heidi Grundmann in 1987 and is online since 1995 (http://kunstradio.at). Kunstradio’s broadcasting time is every Sunday at 23:00 for almost an hour and we broadcast pieces which are made by artists, whom we ask to reflect on the medium radio and its changes. Kunstradio broadcasts most of the time pieces which are made specially for the program, sometimes also live and sometimes also in 5.1 Surround Sound. There is always a signature tune and an introduction which is very flexible in length as this depends on the piece(s), there is no fixed length for the piece, sometimes more than one piece is broadcasted in one Kunstradio show. Soundbees, anywhere & everywhere is an audio piece by AnneMarie Maes and Billy Bultheel. 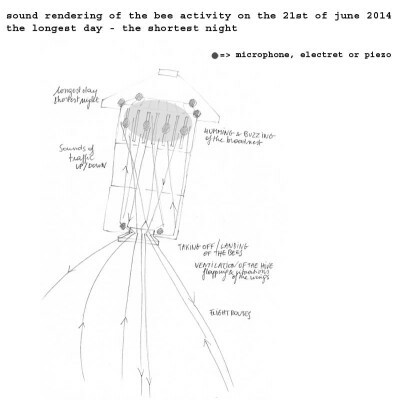 For the Kunstradio BEE-piece, AnneMarie Maes and Billy Bultheel started from the 8-channel field recordings made in the broodnest of the experimental Warré-beehive set-up (see drawing). 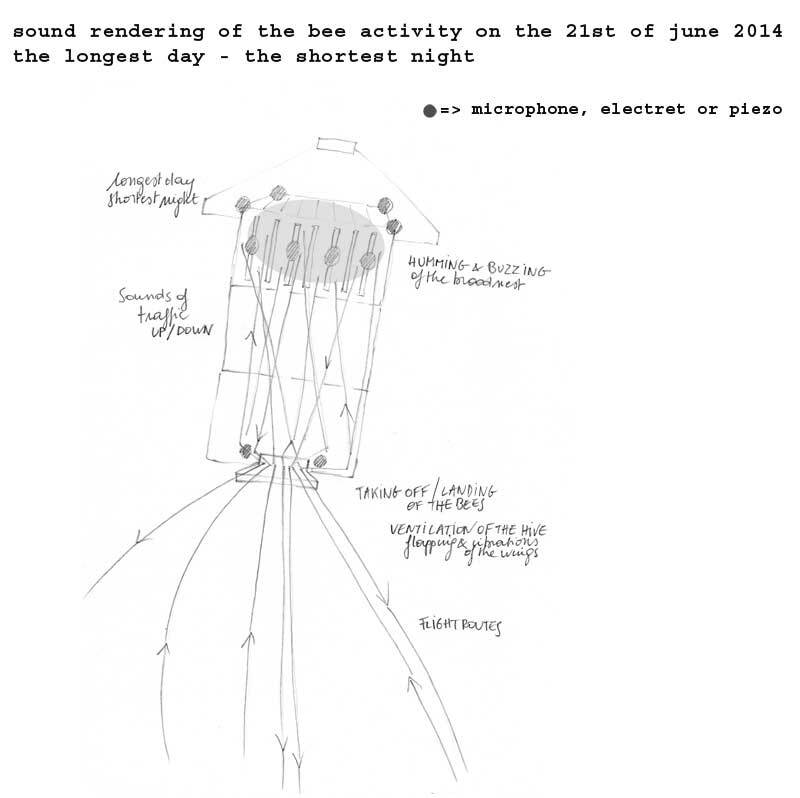 The sound-behaviour of the bee colony was recorded from june 10 2014 and the sound-experiment is still ongoing. For the Kunstradio piece, the artists started to work with the recordings from the longest day / shortest night (24 hours of the 21st of june 2014) and edited them into a 15 minutes-piece on which some processing was done with max msp, using 2 additional sound sources located at the entry of the beehive. 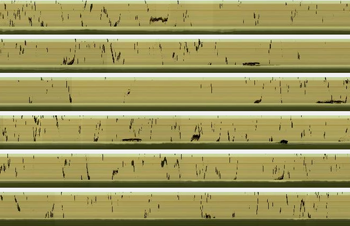 The beehive recordings pan over the spectrum of a day (from midnight to midnight). As a compositional principle different ideas around swarm formation were investigated. The increase and decrease of swarm activity in the hive and its influence on its sound, became a guideline for the transformation of the recordings. Hereby using natural phenomena as musical tools and in retrospect, using musical tools as an artistic rendition or analysis for natural phenomena. The audio work tries to embody the bee swarm while simultaneously intersecting the swarm with swirling electronic sound clusters. The work exists both as a Stereo and as an 8 channel audio work.